Walrus Audio is one of our hottest pedal brands. They're popular because they offers great pedals and a good price and most importantly they sound amazing. All peals are true bypass and run on 9V power. Products include the Voyager overdrive, Jupter fuzz, Decent tri-mode reverb and the Janus Trem-Fuzz. Walrus is getting killer reviews, Premier Guitar thought the Audio Voyager's tone was stellar. Stop by our shop or buy one online and see the full line of Walrus Audio effects pedals for yourself. 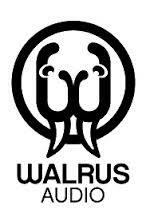 We're an authorized Walrus dealer selling pedals in our Chicago pedal shop and shipping Walrus Audio world wide.